Sweet treats always taste good. 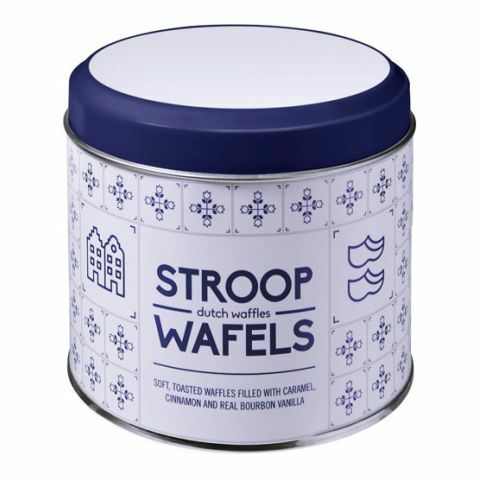 In allbranded you can order various kinds of sweets and have them printed with your company logo or slogan to present as delicious promotional gifts. Whether chocolate, wine gums, mint or chewing gum - we are your partner for sweet reminder advertising with a positive sentimental value for new and existing customers as well as employees and business partners. 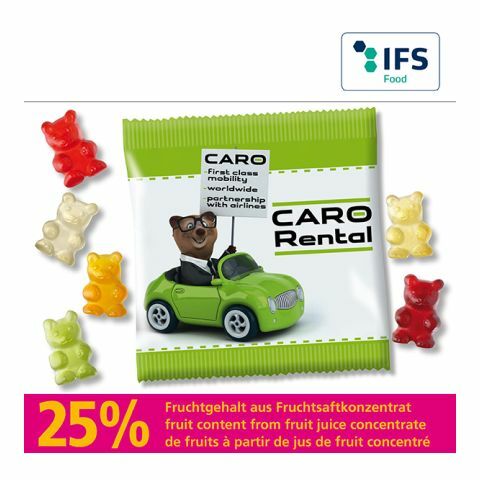 Used as a giveaway at trade fairs,in between times for the appetite, during the meeting in the office or on children's parties to win overthe hearts of the litttle ones, help youreslf to the sweet treats for the success of your company. Sweets are next to pens and lighters probably the most commonly used advertising medium. Inexpensive and yet expressive is the advertising space on the packaging of the sweets. Thanks to the gustatory experience you can also be sure they have a sustainable positive advertising effect. You do not yet rely on the sweet advertising from allbranded? Then browse through our taste experience and discover in our large selection of confectionery a real happy maker. 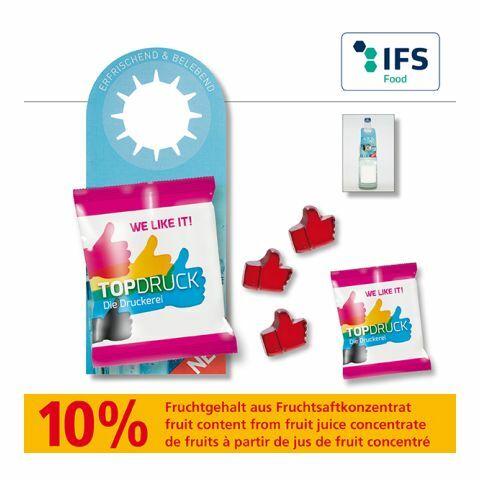 Chocolate, sweets, fruit gums, chewing gums in connection with your brand or claim are ideal promotional gifts for a wide range of target groups and provide a positive perception of the target group and make a large marketing success with very small unit prices. A small snack or the crisis food at a stressful day: Sweets enjoy a huge popularity in the UK and lead your target groups unconsciously to positive associations with the advertisers. 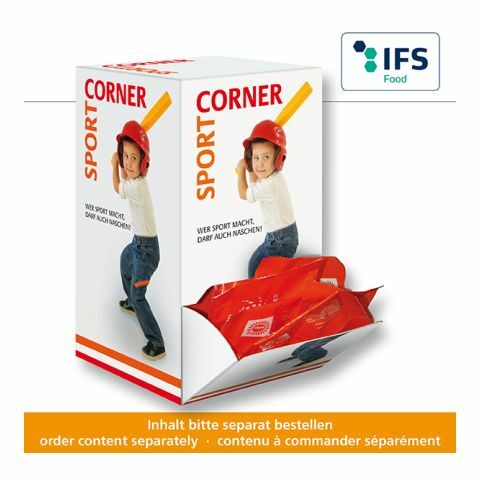 Almost every confectionery product is now also available as a promotional article and by a print of the slogans or logos able to be customized. From brands legal reasons the candies themselves are not printed, but their secondary packaging. Because of the cheap production sweets are before all as a promotional Products that imprint you and your brand into the buyer memory . In particular the use of large events and fairs is widespread and very popular to address effective advertising in the shortest possible time to a high number of people. Sweet means of advertising are welcome at any time of the year, however, the popularity of individual products depends on the season. So fruity sweet goods such as wine gums, are especially gladly seen in summer, whereas yogurt or chocolate coated nuts are especially happy eaten in winter. In allbranded we deal extensively with seasonal offerings, ideally adapted to holidays like Christmas and Easter. Cocoa is hard connected with some traditional festivals: for children the chocolate bunny is firmly set to Easter as well as the Chocolate Nicholas at December. Give the gift of delicious promotional products to your customers and employees in a sweet Advent Calendar with your logo or as part of a comprehensive gift basket. Your employees and customers will be pleased about your attention and feel closely connected with your brand. This is how you build up a sympathy value. In the allbranded online shop we offer you a wide range of snacks for every occasion (and every taste). Behind the cheap giveaways, such as candy, chocolate bars, wine gums and chewing gum, often hide well known brands such as TIC-TAC, Katjes and Ferrero, a high-quality taste and selected quality. But not only the flavor is crucial for the advertising effect. Also a creative design of attention strong advertising space is of notes to maintain your brand recognition, to acquire new customers and and bring a small joy to employees in the name of the company. The logo print is therefore an integral part of your unique advertising medium of allbranded!